just in time for Fresh sewing day! Whilst watching the Olympics opening ceremony on Friday, I finished stitching down the binding on my rainbow bloom. Oh how I love this quilt, it has usurped the HMM quilt as my all time favourite. Aneela's pattern is fab, with well written and easy to follow instructions. I am taking this quilt to Ireland with me to get some decent pics and then it's coming right back home, to live on my sofa. Backing and Binding - Moda extra wide dotty in grey. July was another month of little projects for me. I did a lot of hand sewing, which I am finally starting to like. August is going to be another handstitchy month as I quilt my BQS mini and attempt to make a EPP pillow. 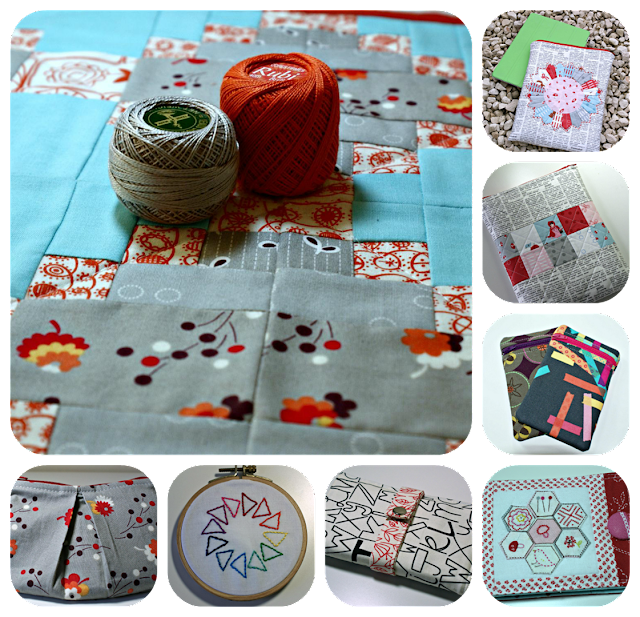 I am linking up with Lynne's Fresh sewing day and WIP Wednesday. I think I'm in love with all the stuff you've made. And it sounds so exotic to "take this quilt to Ireland" to photograph it! You have made so many beautiful things this month - you could be some sort of quilty Olympic eventer! Love that Bloom, it really works well with the rainbow! Your Bloom is so gorgeous - so glad I could help out with the hand stitching. I might just have to make one - seeing how beautiful yours and Charlotte's are (and Aneela's too of course). Wow, you finished a lot in July. Your blooming quilt is beautiful. P.S. I love hand sewing. Wow - spectacular! Also v impressed with your various crafty makes for July - you have been busy - love the circle of flying rainbow geese! The quilt is beautiful, as is the other one in light blue, grey and terra (?). Relieved that sanity prevailed in the end - blooomin` marvelous. Oh Bloom is simply amazing!! I didn't realise just how big it is - what a fantastic finish. Love love love. So so beautiful Kelly! I ♥ it! So gorgeous Kelly - it has turned out so well. And your July makes are all fab - I really covet that little dresden ipad case! loving that bloom, and well done on the binding - I know how you hate that! Your bloom quilt is on MY list of favorites! What a beauty! looks great, look at all that hand stitching!! What a labor of love your Rainbow Bloom is! I don't know that I could've ripped out the stitches as you did during your first round of quilting. I applaud your determination and patience :) It's a *stunning* result. Best Bloom quilt I've seen. 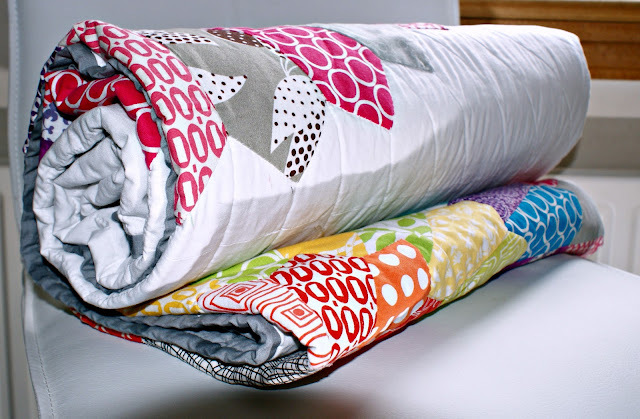 Your bloom quilt is just perfect. LOVE it :) The quilting is spectacular! That quilt is a stunner - be warned somebody in Ireland will want to keep it! So glad that you are going to bring that gorgeous quilt home with you again. I so want to see it IRL one day - maybe at next year's Fat Quarterly Retreat. Are you enjoying all your hand sewing? Thanks for stopping by my blog. Wow, that bloom quilt is fantastic! Every project you showed is simply beautiful! I am so in love with your bloom quilt! What a beautiful quilt, Kelly! I knew it would be gorgeous! 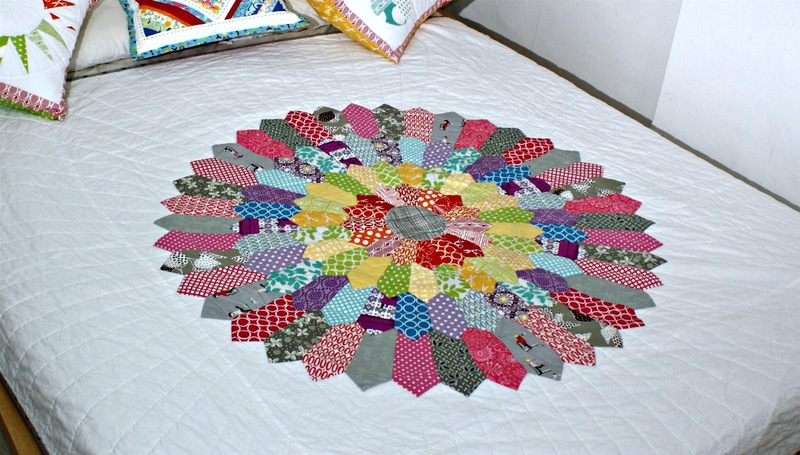 Your Bloom quilt is incredibly gorgeous! Thanks for linking up to WIP Wednesday! Just beautful worth every stitch. You are sure you want to keep your bloom quilt... I can look after it for you, it is SO beautiful! So great to finish one so big this month. Looking good. How did I miss this post about your finished quilt?! This is gorgeous. You should be very proud! I can't wait to see the pictures of it in Ireland, I wish I could take pics of my quilts in Ireland :). I am also still drooling over your dresden ipad cover. I love the newsprint fabric as the background. Cute work you have going on there. It all looks great! Stargazy runner - attempt 2! !